Moore starts his invasion in Italy interviewing workers and managers at a clothing manufacturer and at the well known motorcycle company Ducati. What stands out in this scene isn’t just that the Italian workers are exceedingly happy, but that the management of these companies are motivated to have a happy, and therefore, healthy workforce. In Italy he plants the American flag declaring that he is taking their mandatory vacation time and two hour lunches back to the U.S.
Moore then travels to France to have lunch with some elementary students. The students talk with Moore while drinking glasses of water and passing around real plates of food, family style. The menu, which gets regular community input, includes a cheese and a dessert round! Moore declares that from France, he is taking quality school lunches back to the U.S. These explorations continue on for the majority of the two hour run time. In each new location, a new idea is claimed by Moore for the United States. Each time, the viewer is left wishing that bringing these ideas back to the U.S. was as easy as brining back Saddam Husein’s personal artifacts. At many points in the film Moore provides his interviewees an opportunity to give the U.S. populace some advice. Almost always their message is to live out the values upon which our country was founded. At the end of the movie Moore and a close friend stand in Berlin reminiscing the fall of the Berlin Wall. Moore tells us if the wall that symbolized communism all over the world could be torn down in such short time, we could tear down these political walls that are preventing us from being as happy as the people he encountered in so many countries around the world. 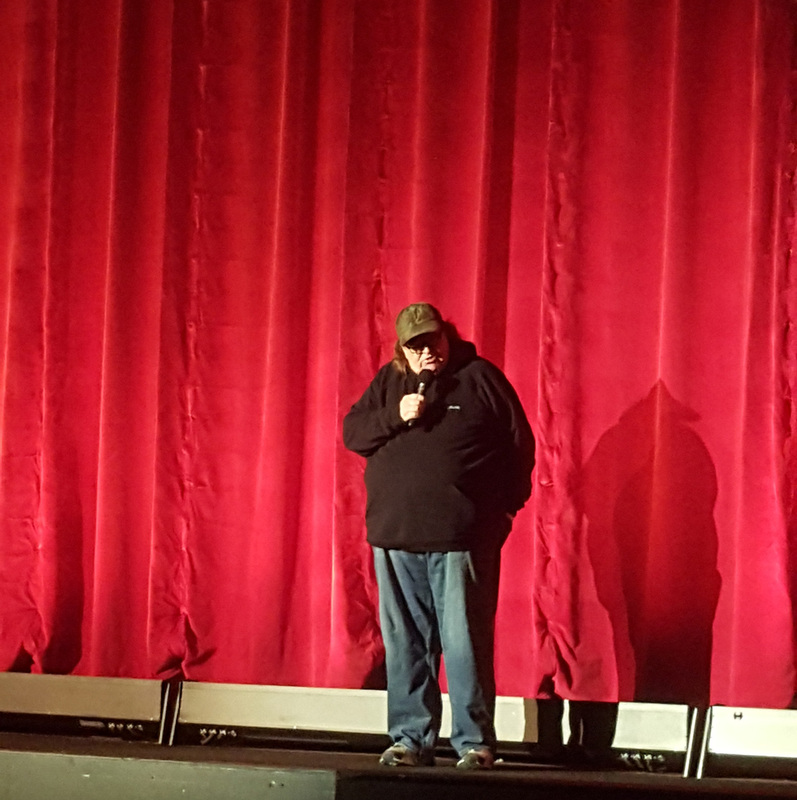 Moore answers questions at the movie’s release in Traverse City, Michigan. Listen up. It’s time to put away your lightsabers and go see a movie that could actually make a difference in this galaxy. If you need to laugh, if you need to be inspired, if you need hope, you will find it in “Where to Invade Next.” If the movie does inspire you, like it did me, I hope you will take Michael Moore’s advice and “do more than just like things on Facebook.” Moore has claimed the ideas we need to advance our way of life, it’s up to us to make it happen using whatever means are necessary. 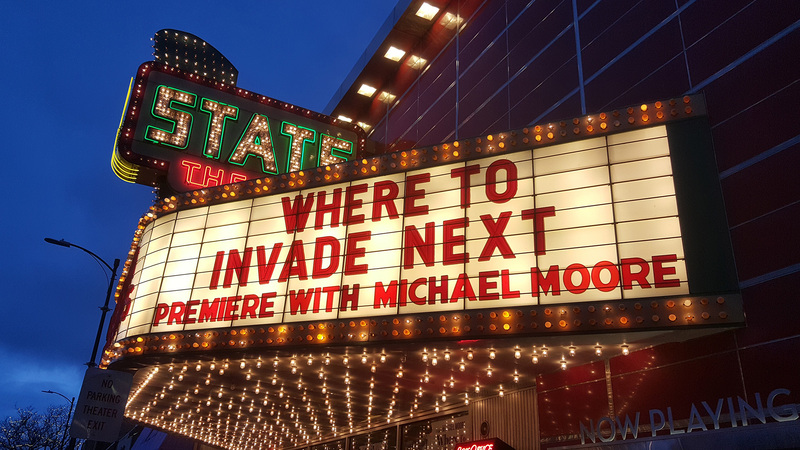 “Where to Invade Next” is being released today in New York and L.A. It will be released everywhere else in February. This entry was posted in Economic Justice. Bookmark the permalink.